Thanksgiving is officially 21 days away and I cannot wait. It is my favorite holiday. How could it not be - a day that starts off with the Macy's Day Parade, then it is followed by food, a nap and then more food? So, in an effort to not feel too guilty about the indulgence of Thanksgiving I am trying to eat a little healthier for the next couple of weeks. So in true California fashion I am turning to kale and quinoa. Yep - had you asked me whether I ate those before I moved to SF I probably would have ignored you and maybe even rolled my eyes. (Back then my diet seemed to consist of NY's finest bagels and pizza) But the California sunshine has changed my ways and now even though kale is uber trendy right now, I am a huge fan. 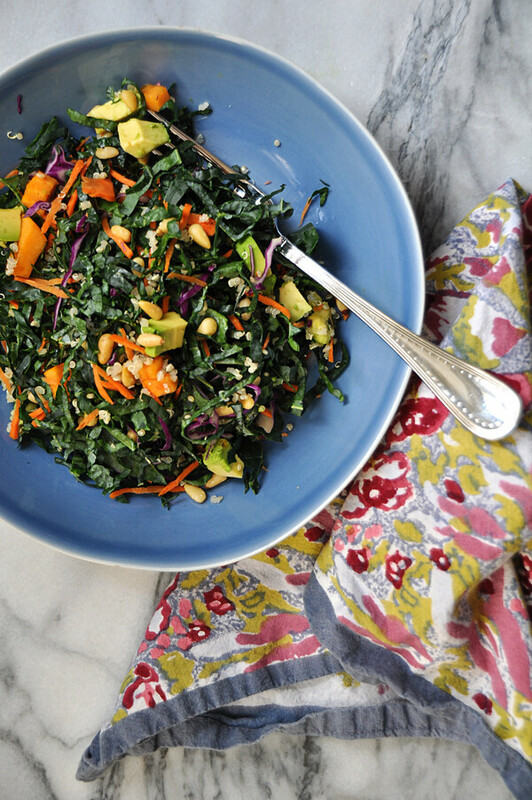 What I like about kale is that it is hearty and eating a salad of it doesn't leave you starving, like most salads do for me. But what I am not a fan of is cleaning kale. It is a serious pain. I thought I would share with you the way I clean kale. The trick that I discovered is to take the kale leaf in two hands and softy (this is the key) pull one side and then the other. This should remove the leaves easily from the middle rib. 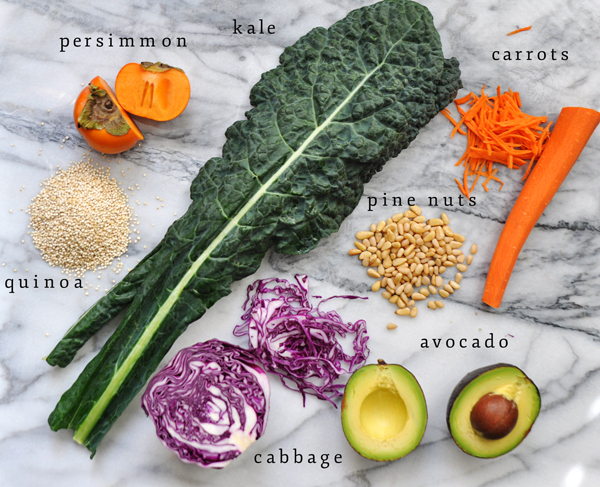 In cooking school I was taught to remove the rib with a knife - but that takes too much time and effort (in my opinion) and if you are going to eat kale, you need to be able to clean it quickly and easily before you change your mind. 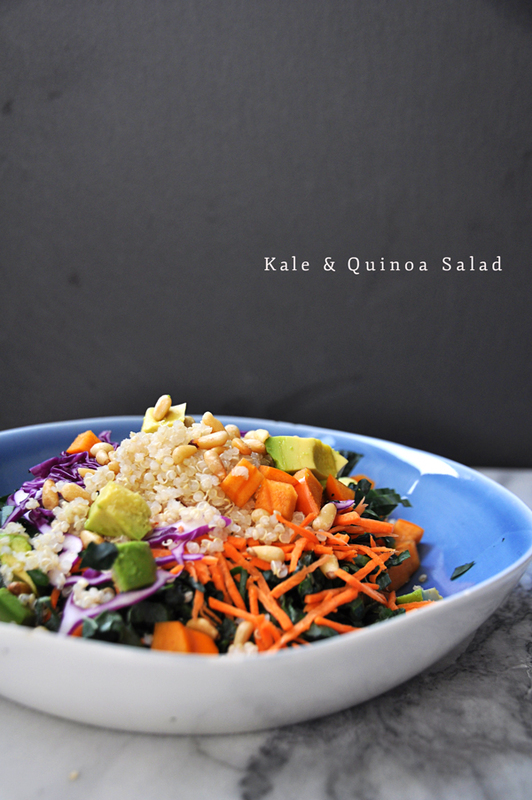 I had a version of this kale and quinoa salad at a restaurant recently and loved it. I tweaked it a little bit to make it more tasty and off course added avocado - another California influence. 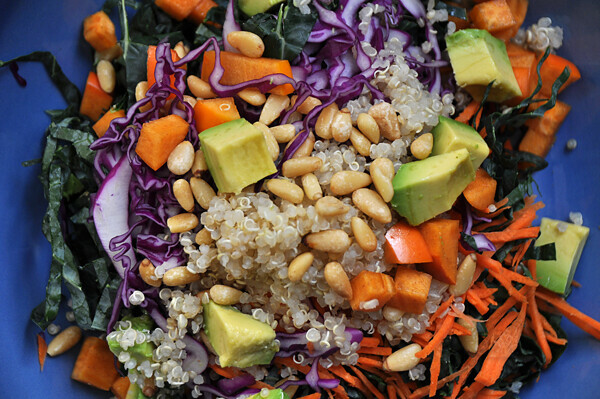 In addition to the kale, quinoa and avocado, I also added persimmon which is in season and absolutely delicious. They are kind of like a cross between an apple and a tomato - sweet and crispy. There are two types of persimmons sold in grocery stores, Fuyu and Hachiya. Fuyu are the ones that I used - you can tell because they are flat on the bottom and shaped more like a tomato. Hachiya have more of an oblong shape and are extremely tart unless they are really ripe. If you have a ripe Hachiya, by all means use that, but Fuyu are easier to buy and find. I also threw in some carrots, purple cabbage, and toasted pine nuts. I finished it with a delicious dressing that has toasted cumin in it to add a little smokey flavor. 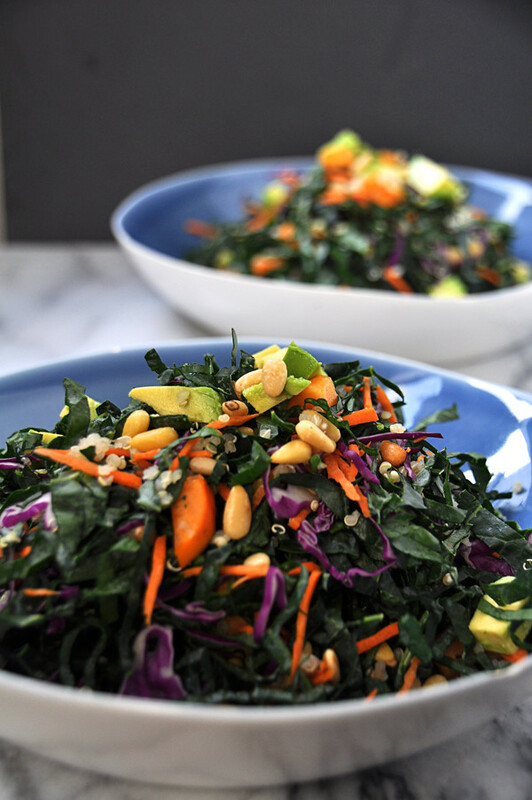 Without intending to, this salad is vegetarian, vegan and gluten-free. But don't let that fool you, it is no wimpy salad. Totally delicious and completely satisfying. I promise. What do you think, will a salad like this make up for all the stuffing and pumpkin cheesecake I plan to eat during Thanksgiving dinner? Maybe, maybe not.